In the early 70’s during the heat of the space race, grinding and shaping of brittle solids became a vital part of the effort. The heart of the problem was how to design very hard materials that could withstand the heat of re-entry into the atmosphere from outer space. Before space age materials, such as the ones used on the space shuttle were invented, many researchers believed that the best heat shield could be made from solid sapphire. The big problem was how to grind and shape them quickly into the desired shape. One of the more interesting reports given was presented by H.L. Oh, K. P. L. Oh, S. Vaidyanathan and I Finnie. 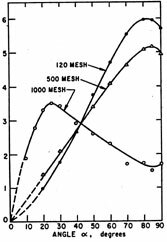 The report listed test results from an experiment where they measured the amount of glass eroded by a spray of silicon carbide particles impacting the glass. They set up the experiment to determine the angle of impact that maximized the amount of material removed. The experiment varied the angle of impact for a very high speed jet of particles. They used a particle velocity of 500 feet per second or 340 m.p.h. (Wow! Now, that’s what I call a SAND BLASTER!). This high speed may sound like something we would never see in lapidary. However, the ultra high-speed rotary handpiece often turns at greater than 300,000 RPM. If you use a 2 mm. bur in these handpieces, then the tool will be moving at speeds greater than 200 feet per second. The results of these tests are shown in the figure shown below. The experiment used three different grit sizes in the test: 120 mesh, 500 mesh, and 1000 mesh. For the coarser abrasives, the fastest material removal rate occurred when the spray was aimed almost directly down upon the glass. The maximum removal rate was at about 10 degrees off axis from vertical for both the 120 grit and the 500 grit abrasive, with removal rate for the 120 grit being greater than the 500 grit.The surprising result was that for the finer 1000 mesh abrasive, the maximum removal rate was at an impact angle of approximately 30 degrees. The 1000 mesh abrasive actually removed more material at 30 degrees than the 120 mesh abrasive. The 1000 mesh removal rate at 30 degrees was over twice the removal rate of the 120 mesh. What’s going on here? There appears to be some sort of size effect on the strength of the glass. Why should the smaller grit remove more material than the larger grit at any angle? Have you seen any similar behavior when grinding with very fine abrasives? Does this have ramifications for a good pre-polish?